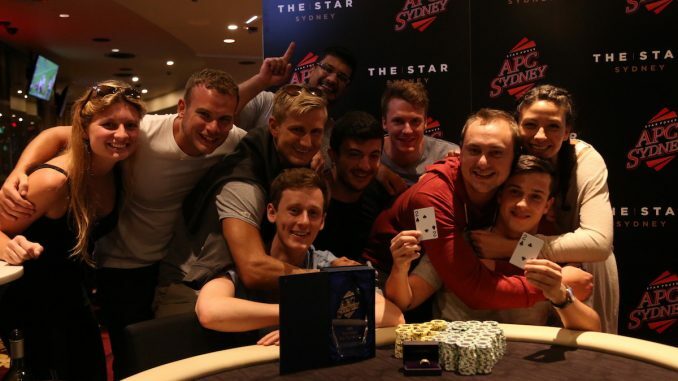 The newest edition to the Asia-Pacific poker scene was held at The Star Poker Room in Sydney from March 8 through 22 with the inaugural Australasian Poker Challenge (APC). Some of the best local and international talent descended upon The Star across the nine event schedule, including Australia’s WSOP champion Joe Hachem, American high stakes pro Andrew Lichtenberger and WSOP bracelet winners Jeff Lisandro, Gary Benson, Mel Judah, Alexander Antonios, Andrew Hinrichsen, Jarred Graham, Rory Young and Sam Higgs. However, they were all outshone by rising star Alex Lynskey (pictured above holding cards, surrounded by his support group). The 25-year-old from Brisbane began the week by winning the Opening Event for $52,680, and then went one better by taking down the very first APC Main Event for $212,112. Having safely navigated his way through Day 1, Lynskey made his move late on Day 2 to head in to the third and final day as chip leader of the 36 remaining players. 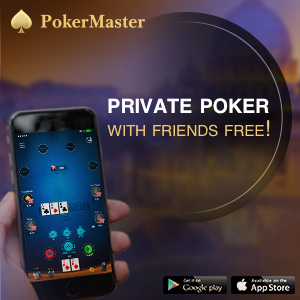 By the time the final table of nine players was set he sat fifth in the chips. But his skills shone through when it mattered most as he proceeded to build the big stack before outlasting runner-up Ray Lapitan in an epic heads-up battle that lasted three hours. Aside from his prize money, Lynskey took home the inaugural APC Main Event trophy as well as a diamond and ruby encrusted gold ring from Cerrone valued at $9,500. The $2,200 APC Main Event featured three Day 1 flights and was Australia’s largest repechage event, meaning players who busted an earlier flight could buy back into one or both of the remaining flights. The final field of 444 runners created a prize pool of $888,000. More than 1,500 players took part across the nine-event schedule with the popular $330 Opening Event attracting 878 runners. The PMA 6-handed event also attracted a decent field of 126 and was won by Khac Tran for $$32,760. The $5k Challenge was the other event of note, attracting 126 entries and being won by local pro and High Roller specialist Daniel Neilson. For details about how the action played out in the PMA 6-handed, $5k and Main events, see our APC live reporting page.